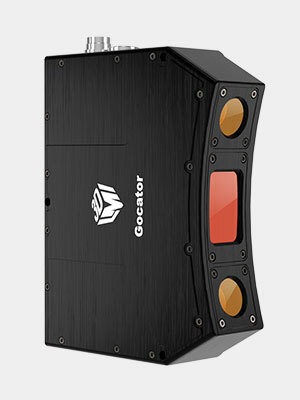 Large Field of View 3D Snapshot Sensor Use Gocator 3210’s blue-LED structured light technology and wide field of view for full field inspection of large targets (e.g., automotive components and assemblies). •	Fast scan rate (6 Hz w/ acceleration) •	2-megapixel stereo camera minimizes occlusions •	Large field of view (FOV) up to 100 x 154 mm •	Pick-and-place friendly for robotic/stationary inspection applications •	Gocator 3210 Datasheet - Large Field of View 3D Snapshot Sensor Gocator 3210 provides a large field of view and measurement range, letting you perform quality inspection on multiple features with a single snapshot. The all-in-one smart snapshot sensor offers high resolution for accurate measurements down to 35 μm* using a stereo camera and an industrial projector to deliver long lifetime and uniform lighting throughout the measurement volume.